A few nights ago I popped into Waitrose and got a bit of a surprise! It had been a couple of weeks since I'd been in and the whole front area was different. For those who haven't already seen this it's now become more like a reception area with a hotel style desk. All the magazines have been moved away (down to where the cards are - near the wine.) Alterations were implemented during the night over the course of a week and were finished around two weeks ago now. 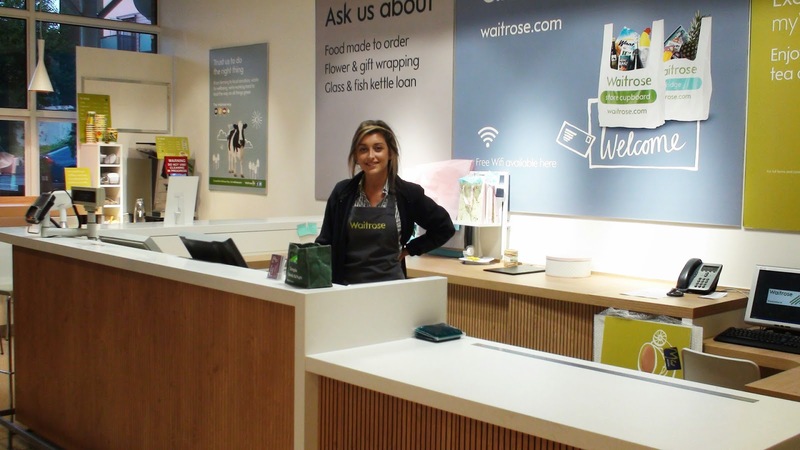 As of September, Waitrose will become one of the John Lewis 'Click and Collect' collection points and this renovation was partially to have convenient place for people to collect their John Lewis orders from. There still doesn't seem to be a great wealth of information about this newish concept on the interweb but Waitrose has a bit about it here and John Lewis has a bit here. The whole idea is that you will be able to place an order with John Lewis and instead of either having to trek down to Kingston or pay for delivery to your home at a time most inconvenient for you, they will deliver it to Waitrose in Worcester Park for free for you to pick up from there the next day. That was my first thought too. (Isn't it great when we all have the same first thought together.) But after some contemplation I thought no, actually it's the opposite. How many more people would stay in Worcester Park to do all their shopping if there was a John Lewis in Central Road? Well in the same way what it means is that the people who would ordinarily go and spend a few hours and a bundle of cash in Kingston shops, attracted in part by the John Lewis, may instead stick around in Central Road, use our local shops (especially with their new Worcester Park Key card) and get their John Lewis fix from our local Waitrose instead. As well as being good for the local economy it also means less cars on the road as many people who would drive to Kingston can walk to Waitrose. It seems to me that everyone's a bit of a winner! Okay it might not transform the area just like that - but I do see it as a positive thing for Worcester Park. Feel free to disagree dear reader... what do you think...?